ابراهیمی کیا, مژده, عنایتی, حمید. (1392). نقش سنجش از دور و روش های هوایی درکشف نشت از خطوط لوله گاز طبیعی. 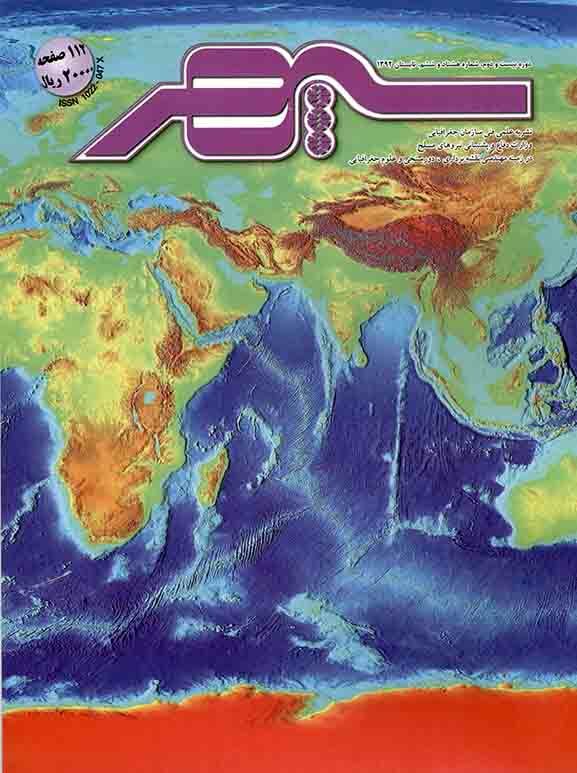 فصلنامه علمی- پژوهشی اطلاعات جغرافیایی « سپهر», 22(86-1), 43-48. مژده ابراهیمی کیا; حمید عنایتی. "نقش سنجش از دور و روش های هوایی درکشف نشت از خطوط لوله گاز طبیعی". فصلنامه علمی- پژوهشی اطلاعات جغرافیایی « سپهر», 22, 86-1, 1392, 43-48. ابراهیمی کیا, مژده, عنایتی, حمید. (1392). 'نقش سنجش از دور و روش های هوایی درکشف نشت از خطوط لوله گاز طبیعی', فصلنامه علمی- پژوهشی اطلاعات جغرافیایی « سپهر», 22(86-1), pp. 43-48. ابراهیمی کیا, مژده, عنایتی, حمید. نقش سنجش از دور و روش های هوایی درکشف نشت از خطوط لوله گاز طبیعی. فصلنامه علمی- پژوهشی اطلاعات جغرافیایی « سپهر», 1392; 22(86-1): 43-48. امروزه میزان مصرف انرژی در کشور ایران بطور چشمگیری افزایش یافته است. انرژی گاز یکی از مهمترین آنها بشمار میآید. مصرف گاز تا سالهای آینده بطور فزایندهای افزایش خواهد یافت و خطوط انتقال آن نیز بسرعت رو به گسترش است. طول این خطوط در شبکه گاز رسانی به هزاران مایل نیز میرسد و اطمینان یابی و کشف بموقع نقص هر بخش از خطوط لوله مهم و ضروری است. این مقاله مروری بر تکنولوژی کنونی کشف نشت از خطوط لوله گاز دارد و نقش سنجش از دور و استفاده از روشهای هوایی را در کشف این مهم خاطر نشان مینماید. در بخش اول روشهای متفاوت کشف نشت که در خطوط لوله گاز بکار میرود بطور مختصر مرور میشود و در بخش دوم به روشهای نوری و استفاده از سنجش از دور و روشهای هوایی جهت کاهش هزینه و سرعت انجام نشت یابی مناطق وسیع پرداخته میشود. در پایان، ضمن جمعبندی، روشهای کشف نشت با هم مقایسه میشوند. Nowadays, energy use has increased dramatically in Iran. Gas is one of the most important energy resources. Gas use will grow in future and its pipe lines are quickly developing. The length of this gas distributing network reaches thousands of miles, so validating and timely defect detection in each part of pipe line is important and essential. The present article reviews current technology of leakage detection in pipe lines and points out the role of remote sensing and aerial methods in this detection. In the first section, different leakage detection methods applied on gas pipe lines are shortly reviewed and the second section focuses on optical methods and applying remote sensing and aerial methods with the aim of decreasing costs and time of leakage detection in vast areas. Finally, different methods of leakage detection are compared in the conclusion. Number: 8/03A120, Universityof Texas, Austin. 3- Hough J.E., 1988, “Leak testingof pipelines uses pressure and acoustic velocity”, Oil and GasJournal, vol. 86, pp. 35-41. 4- Klein W. R, 1993,. “Acoustic leak detection”, American Society of Mechanical Engineers, PetroleumDivision, 1993, vol.55, pp. 57-61. 5- Sperl J. L, 1991, “System pinpoints leaks on Point Arguello offshore line”, Oiland Gas Journal, September Issue, pp. 47-52. 6-Tracer Research Corporation, 2003, Patent Product described in the Website of Tracer Research Corporation, www.tracerresearch.com. 7-Turner N. C,, 1991, “Hardware and software techniques for pipeline integrity and leak detection monitoring”, Proceedings of Offshore Europe 91, Aberdeen, Scotland. 8- Bose J. R., and Olson M. K., 1993, “TAPS’s leak detection seeks greater precision”, Oil and Gas Journal, April Issue, pp. 43-47. 9- Griebenow G., and Mears M, 1988, , “Leak detection implementation: modelling and tuning methods”, American Society of Mechanical Engineers, Petroleum Division, vol. 19, pp. 9-18. 10- Liou J. C. P., and Tian J., 1994, “Leak detection: a transient flow simulation approach”, American Society of Mechanical Engineers, Petroleum Division, vol.60, pp. 51-58. 11- Natural Gas Leak Detection in Pipelines, Yudaya Sivathanu, U.S. Department of Energy. 13- Iseki T, Tai H and Kimura K 2000 A portable remote methane sensor using a tunable diode laser Meas. Sci. Technol. 11 594-602 . Image Scientist, ITT Space Systems Division. 15- Airborne Leak Detection, Comparing Technologies. 18- Radar Detection and Monitoring of Gas Pipeline Leaks, Sami Gopalsami, Anuj Dron, Tom Elmer, and Paul Raptis, Energy Technology Division, Argonne National Laboratory, Argonne, IL, USA, September 16 - 17, 2002. 19- Thermal imaging cameras for optical gas imaging (OGI) and furnace inspections. 21- Study on oil-gas reservoir detecting methods using hyperspectral remote sensing. Qingjiu Tian, International Archives of the Photogrammetry, Remote Sensing and Spatial Information Sciences, Volume XXXIX-B7, 2012 XXII ISPRS Congress, 25 August01. 22- Heather Freeman. Evaluation of the use of hyperspectral imagery for identification of microseeps near Santa Barbara, California[R/OL].California,Sep.26, 2003.